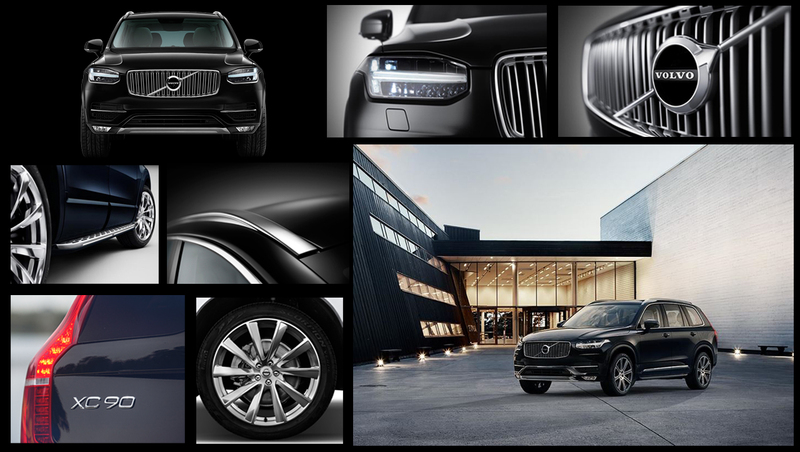 The all new XC 90 is a game changer for Volvo. This machine has been assigned the herculean task of taking on formidable rivals such as the sublime Mercedes GL, Audi Q7, Range Rover and the BMW X5. The XC 90 is like a metamorphosis for Volvo – it aims to change the brand’s formerly boring and conservative image into that of a sophisticated, innovative car maker with high aspirational value. So does this elite Swedish warrior pack enough punch to battle it out with the likes of the Teutonic trio? 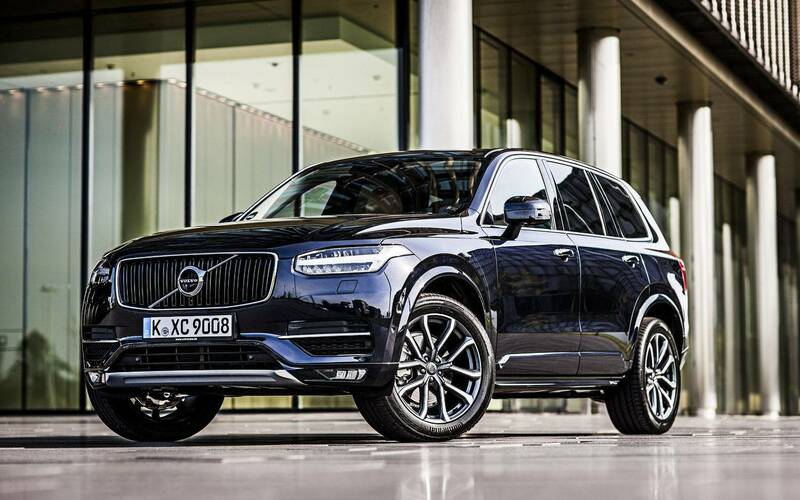 Will the XC 90 be the next most desired family SUV? Read on to find out. Volvo came under Chinese ownership in 2010 but thankfully none of that Chinese influence has made its way into any aspect of the SUV range. The XC 90 looks like a high quality premium vehicle from every angle and has amazing street presence thanks to its exquisite well balanced styling plus the fact that it is just a whisker short of being 5 meters long. The front features LED lights and THOR-hammer running lights. The grill gets a slathering of chrome but it still manages to appear un-ostentatious and classy. The top Inscription model gets a chrome strip along the sides too. While the front end is radically different compared to all other Volvo cars, the back does contain some signature Volvo touches such as the vertical tail lamps while the roof rails, rear spoiler and the spectacular alloy wheels ensure that the XC 90 turns plenty of heads at street level. Winner of the best design award at the Red Dot Awards ceremony that took place recently in Germany this car manages to do what no other Volvo SUV has done before – its the first Volvo with real street cred. 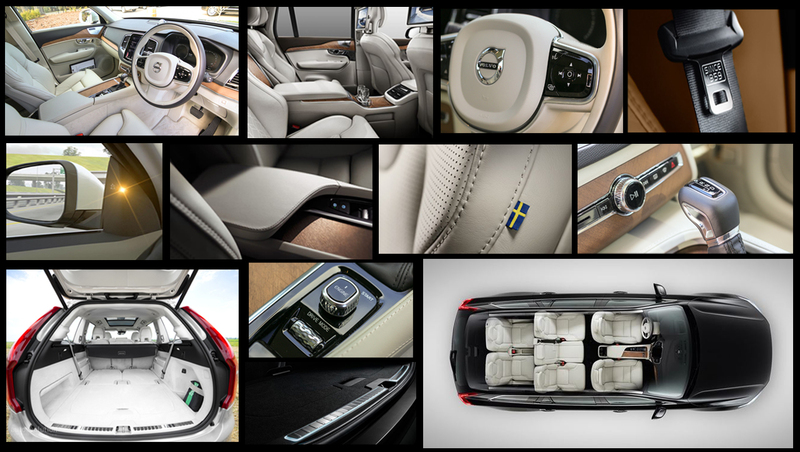 Step inside the XC 90 and the first thing that you notice about the cabin is a sense of real space. This combined with the fine leather and minimalist styling make the interior of this family car a very nice place to be indeed. Volvo has compared the interior to a Swedish sanctuary but we think that its more akin to being in an upmarket Italian leather store! Even the third row seats are quite usable – Volvo says that anyone who is up to 170 cm tall can fit in pretty comfortably in the back. The XC 90 has 451 litres of boot space, even with all the seats occupied while that number expands to a massive 1102 litres with the middle and back row seats folded. Owing to a generous dose of real wood and brushed aluminium trimmings the interior oozes sheer elegance and refinement – everything feels very smooth and expensive to the touch. The three-spoked steering wheel is a tad small, although larger than the one in the previous model. Still, it looks dainty and stylish and feels good to grab on to – the slightly smaller size giving it a sporty feel. The seats are incredibly supportive and you really begin to appreciate them on longer drives. The middle row seat can be adjusted to occupy a child too and all rows get AC vents and the cabin is equipped with quad-zone climate control. Current manufacturer trends perceive a need to cram a lot of gratuitous hi-tech gadgetry into the vehicle in order to impress buyers and outdo their rivals. But the XC 90 is nothing like that, instead impressing with its simplicity that sees the front dash feature just 8 physical buttons. Everything else is controlled by the touch-screen infotainment system, which is quite easy to get the hang of. It is very similar to operating a tablet or smartphone (especially Apple products) – it contains a screen with applications (entertainment, drive settings, navigation etc) with the driver simply clicking the one needed. This infotainment system is miles ahead in front of BMW’s iDrive in terms of simplicity and ease of use. 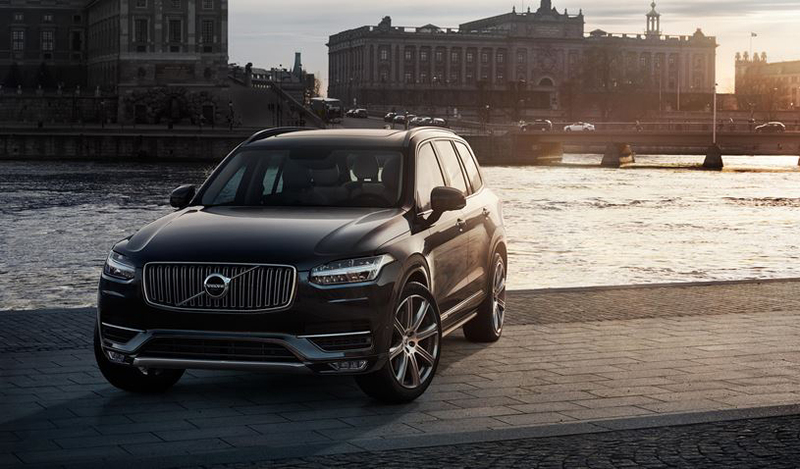 The Volvo XC 90 is available with two petrol engines – the T6 and T8 and one diesel engine (D5). The T6 is a 2 litre, 4 cylinder, supercharged and turbocharged engine that produces 320hp and 400 Nm of Torque. This engine is mated to an 8-speed automatic transmission and drives all four wheels for superior driving dynamics. The T8 is a 2 litre supercharged and turbocharged plugin hybrid petrol engine with two modes. 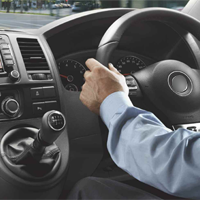 Pure or eco mode priorities utilises electric power and is meant for city driving. Power mode makes the most out of both the electric motor and the petrol engine to produce 376 hp and 620 Nm of maximum torque. You can also choose a battery charging mode wherein the batteries are charged while driving to deliver 20 km worth of pure electric power. This engine too, is coupled with an 8 speed automatic transmission and features AWD. The D5 is a 2 litre dour cylinder diesel engine that delivers 225hp and 470 Nm of torque and is mated to an 8 speed automatic gearbox that drives all the four wheels. The Volvo XC 90 excels at the tasks that it will be performing most of the time – school runs, shopping trips and the occasional picnic to the country side. All the three engines displace just 2 litres but they manage to seem much larger and more powerful allowing the vehicle to pull briskly and cleanly from a standing start. The gearbox is very efficient and ensures quick, seamless shifts although the T6 and the D5 begin to get a bit audible if you push them too hard. However, the T8 delivers a whopping 620 Nm of max torque – making it the one to opt for if looking for a complete drivers experience. The ride is good most of the time – larger potholes and bumps are noticeable from the the cabin but choosing air suspension, which is an optional extra, rectifys this. In terms of weight, overall the car has shed 125 kilos with the result being much improved dynamics. The XC-90 does have an off-roading mode and can handle rough terrain with ease. Safety is The Volvo brand has become synonymous with safety and Volvo have committed to making its cars casualty-free by 2020.
roll over protection and a lot, lot more! If you want complete peace of mind – then look no further than a Volvo. The XC 90 is good looking, roomy, comfortable with good on and off-road manners. It is light years ahead in terms or quality and refinement over the earlier model. However, this means that it is now costlier – the base model is priced at just less than 100k plus extras and on road costs. Overall, the XC 90 is an amazing achievement by Volvo. But the big question is – Will people choose it over a Merc, Audi or a BMW? The GL’s USP is colossal comfort; the BMW has the best dynamics and the Audi Q7 has amazing build quality but the new model is not particularly good looking. The Range Rover has incredible off road ability. The XC 90 has less of that but does possess fine balance of ride and a high level of comfort and handling. Also, it has a fantastic cabin, it looks tremendous and it is the safest thing on 4 wheels in Australia! 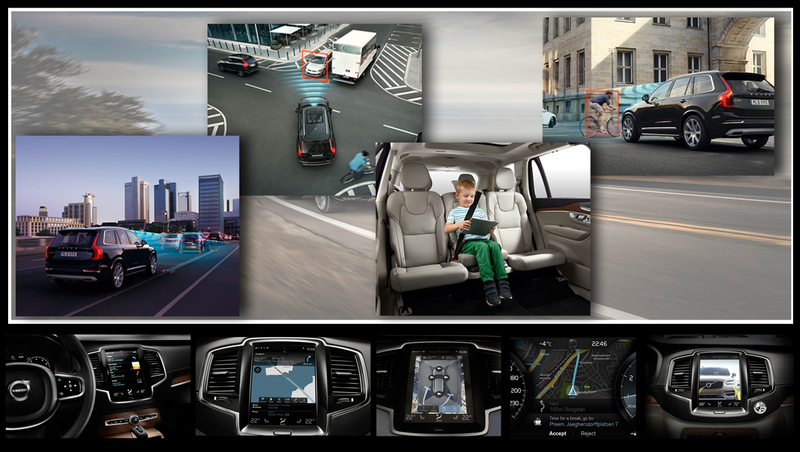 All of this means the XC90 varries great appeal for families. Volvo managed to sell 15000 units of the earlier XC 90 model so we’re quietly confident this newer & better model will surely outstrip that figure.